Hi friends! I hope you are well! We are ok. A couple of the kids seem to have a little cold. Fingers crossed that it doesn't get worse than that. 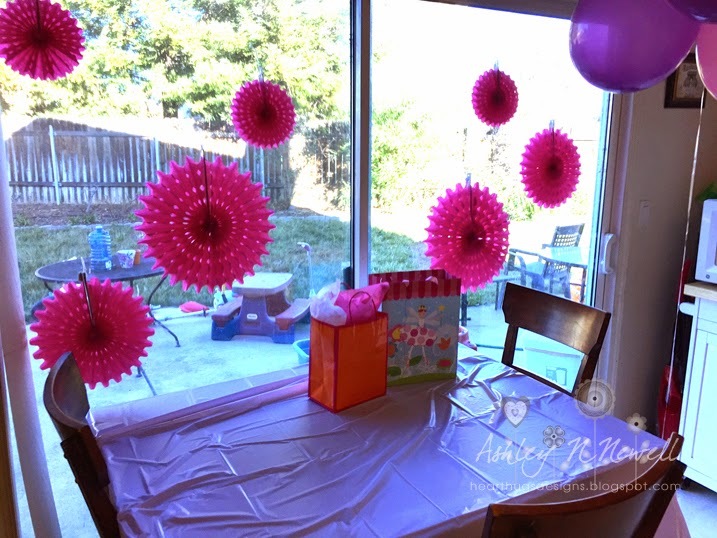 Today, I'm sharing some pictures from my daughter's birthday party. Sigh... I'm late in sharing the pictures. I was late in having the party. I guess the theme should have just been LATE. ;) Originally, we were going to do a Princess Tea Party themed party but we were so sick in late December and almost all of January. We decided to throw together a little party and this is what I came up with. I spent almost nothing on this party but we were all happy with it. 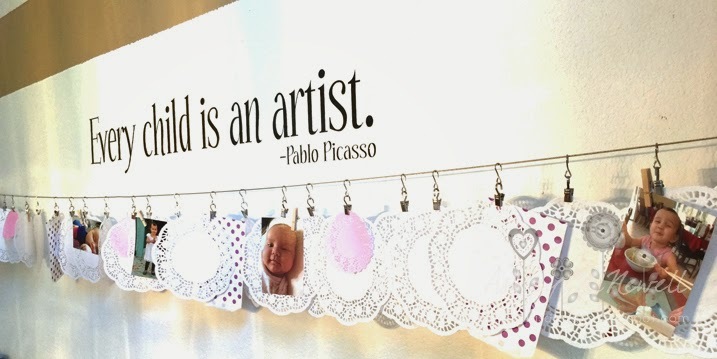 I always have this line and hook thing (I don't know what it's called) from Ikea up for the kids's art. I decided to change out all the kid art with some pictures, doilies, and some Whisker Graphics Bitty Bags. I love this little area! I framed a doily that I wrote on. The writing says "Thanks for coming to celebrate our Cutie!" We gave away Cutie oranges as party favors because I'm kind of done buying tiny cheap toys that will get thrown in the trash. I added a jar with burlap and lace, a candle, and a framed pic. I thought this was so cute! Here's the gift table and back door decorated. We also hung some balloons that I blew up from the light fixture. So easy, so cheap! 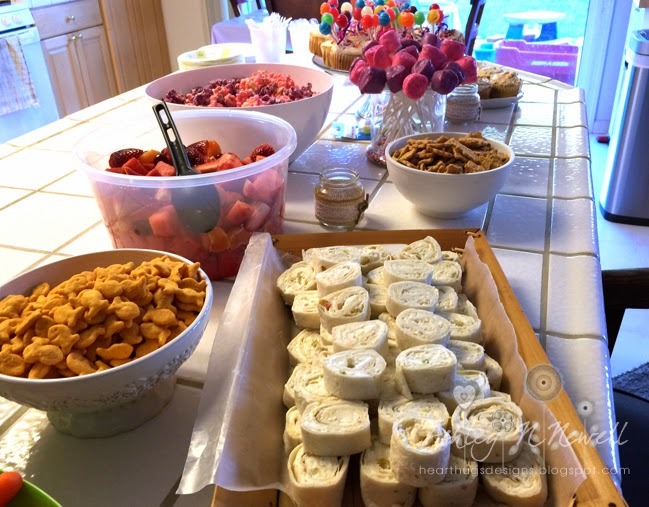 Here's some of the food I made for the party. Let me know if you want any recipes! My daughter LOVES balloons and lollipops so I made these little balloon bouquet cupcakes for her. I used the cheap thin ribbon from Michael's to tie a bow around the center lollipop. I made dipped marshmallows in pink and purple. I put them in a jar with some sprinkles at the bottom. These were a HUGE hit and they are SO much easier than cake pops! I made some colored popcorn for the party as well. This is SO easy and everyone loves it. Let me know if you want a recipe post! 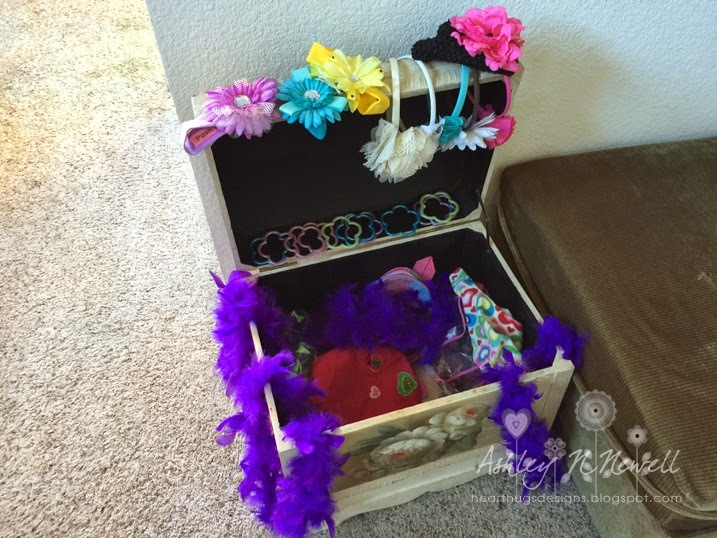 I hope you enjoyed a look into my daughter's birthday! Have a great day, friends! Everything looks so lovely, Ashley! I specially love the idea of the Cutie oranges as party favors. So much better!!! So cute! I love it! 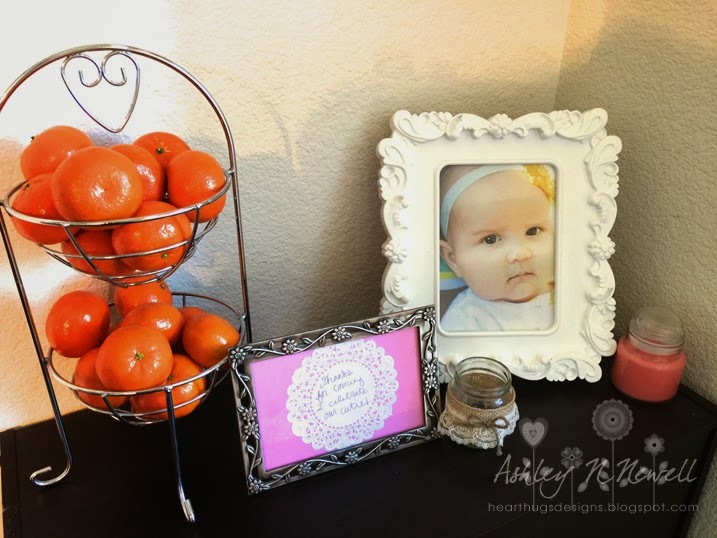 The line with the doilies and photos is precious and love all your fun treats!